Segways are still relatively new in the commuter-using world but are perfect for a group tour around town. Not as strenuous as a bike but still much faster than walking, a Segway is a fun and reliable mode of transport for the summer months. A Segway is a two wheeled, self-balancing, battery powered machine operated by the driver who stands on a middle platform commanding it by shifting their weight. It doesn’t take long to master and on every tour you will first receive a little training before you are allowed to reach the top speed of 20 km/h. 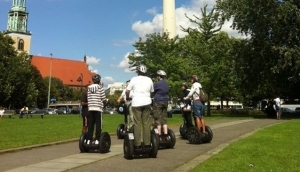 On a Segway tour through the city you will zip around the city and see sights like Tiergarten, the Memorial to the Murdered Jews of Europe and journey along the path of the famous Berlin Wall.